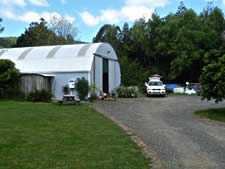 Waitaia Advanced Native Trees is a specialised Coromandel nursery. All our specimens of native trees, shrubs, flaxes and ornamentals in stock are especially suited to grow in the coastal conditions of the Coromandel Peninsula. Our fine display of healthy, vigorous plants bears testimony to our careful selection of a variety of New Zealand trees and plants. Open to the Public Thursday – Sunday 9am - 5pm. Open at other times by phone appointment. Why Advanced Native Trees? Well when we source our stock from plant wholesalers each variety is carefully selected for it’s suitability for the particular coastal conditions here on the Coromandel Peninsula. We then re-pot each tree, shrub or native grass as necessary and nurture it until we are confident it has acclimatized to the coastal environment before we offer it for sale to the public. Our Coromandel nursery is open for public sales and enquires Thursday to Sunday 9am – 5pm & also during school and public holidays. Also open by phone appointment. The Waitaia Coromandel Nursery has a wide variety of plants and trees, big or small, all are coastal hardy. We offer a wide range of coastal hedging ideal for decorative gardens or as shelter and have a great selection of flaxes and grasses suitable for your landscaping requirements. We carry a good stock of yummy fruit trees – citrus, plums, peaches, apples , feijoas, avocados, and olives. Just take a look at our heavily laden resident grapefruit and orange trees. Our plants are all of an excellent quality and we are always available to assist with any enquiries you may have about plant suitability, plant care or plant health. If we haven’t got what you want, we will do our best to get it for you from our extensive range of suppliers. Why not take the time to visit us in our peaceful Coromandel nursery setting at Kuaotunu. We look forward to seeing you when you visit us at our nursery. If passing by call in and browse around. Our nursery services include Native Trees and Shrubs which we have nurtured from base stock to present to you in a strong and vibrant condition ready for the local coastal gardens of the Coromandel Peninsula. “The Waitaia Advanced Native Tree (W.A.N.T) nursery is proud to bring to you a comprehensive range of carefully selected specimens of native trees. “The Waitaia Advanced Native Tree(W.A.N.T) nursery is proud to bring to you our range of carefully selected selection of fruit trees and edibles. We have chosen those varieties displayed below as representative of typical fruit trees we know will thrive in our coastal Coromandel Peninsula gardens. What greater pleasure is there than to be able to pick fresh fruits from your very own trees during your relaxing summer break at the beach ? “The Waitaia Advanced Native Tree nursery has a comprehensive range of carefully selected specimens of native shrubs and hedging plants. Those we have chosen in our range are proven to grow into strong and vibrant hedging plants, particularly hardened to the coastal Coromandel Peninsula environment before we offer them for sale. Those we have displayed below are recommended by us as suitable to bring to your garden selective colourful features or can be used as background borders.Our flaxes in particular provide a great food source for teh native birds especially the Tui & Bellbird – always welcome visitor to any coastal garden. Our nursery services include a hire service to enhance the décor of your event. Turn your Marquee, Hall or other venue into a delightful wonderland with the addition of full size living trees and shrubs. We have close relationships with Coromandel’s premier Landscape Designers. We can arrange the design and planting of your garden anywhere on the Coromandel Peninsula, you do not need to be here. View our range of Native Trees, Native Shrubs, Fruit Trees, Hedging Plants, Flax and Grass plant stock below. Directions to Waitaia Coromandel Nursery. From SH 25 turn right at our sign (if coming from Whitianga ) or turn left into Waiataia Road from SH 25 if coming from the Kuaotunu direction. Drive up Waitaia Rd for 200m (# 85) before turning left across the concrete bridge.Immediately on your right is the entrance gate to the nursery. Please drive right in – there is plenty of parking space.